We are several weeks into school now, and surely all of the mom's out there are seeing the homework start to pour in. I posted some writing helps for teens a few weeks ago, and wanted to make sure and get tips out there for parents of younger children. Hopefully the advice you find below will help boost your enthusiasm and maybe garner some fresh approaches. Actually the info is quite applicable for middle and high school students as well. Some kids are born with a natural grasp for language and words, and others find putting pen to paper torturous. Either way our children will surely benefit from some extra help from us! Encourage (but do not demand) frequent writing. Be patient with reluctance to write. "I have nothing to say" is a perfect excuse. Recognize that the desire to write is a sometime thing. There will be times when a child "burns" to write; others, when the need is cool. But frequency of writing is important to develop the habit of writing. Ask to see the child's writing, either the writing brought home or the writing kept in folders at school. Encourage the use of writing folders, both at home and at school. Most writing should be kept, not thrown away. Folders are important means for helping both teachers and children see progress in writing skill. Be affirmative about the child's efforts in school writing. Recognize that for every error a child makes, he or she does many things right. Applaud the good things you see. The willingness to write is fragile. Your optimistic attitude toward the child's efforts is vital to strengthening his or her writing habit. Be primarily interested in the content, not the mechanics of expression. It's easy for many adults to spot misspellings, faulty word usage, and shaky punctuation. Perfection in these areas escapes most adults, so don't demand it of children. Sometimes teachers -- for the same reason -- will mark only a few mechanical errors, leaving others for another time. What matters most in writing is words, sentences, and ideas. Perfection in mechanics develops slowly. Be patient. Find out if children are given writing instruction and practice in writing on a regular basis. Daily writing is the ideal; once a week is not often enough. If classes are too large in your school, understand that it may not be possible for teachers to provide as much writing practice as they or you would like. Insist on smaller classes -- no more than 25 in elementary schools and no more than four classes of 25 for secondary school English teachers. Ask if every teacher is involved in helping youngsters write better. Worksheets, blank-filling exercises, multiple-choice tests, and similar materials are sometimes used to avoid having children write. If children and youth are not being asked to write sentences and paragraphs about science, history, geography, and the other school subjects, they are not being helped to become better writers. All teachers have responsibility to help children improve their writing skills. See if youngsters are being asked to write in a variety of forms (letters, essays, stories, etc.) for a variety of purposes (to inform, persuade, describe, etc. ), and for a variety of audiences (other students, teachers, friends, strangers, relatives, business firms). Each form, purpose, and audience demands differences of style, tone, approach, and choice of words. A wide variety of writing experiences is critical to developing effective writing. Check to see if there is continuing contact with the imaginative writing of skilled authors. 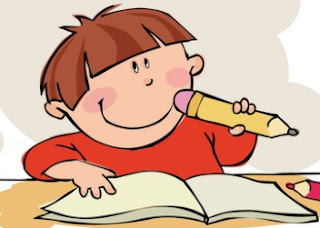 While it's true that we learn to write by writing, we also learn to write by reading. The works of talented authors should be studied not only for ideas but also for the writing skills involved. Good literature is an essential part of any effective writing program. Watch out for "the grammar trap." Some people may try to persuade you that a full understanding of English grammar is needed before students can express themselves well. Some knowledge of grammar is useful, but too much time spent on study of grammar steals time from the study of writing. Time is much better spent in writing and conferring with the teacher or other students about each attempt to communicate in writing. Encourage administrators to see that teachers of writing have plenty of supplies -- writing paper, teaching materials, duplicating and copying machines, dictionaries, books about writing, and classroom libraries of good books. Work through your PTA and your school board to make writing a high priority. Learn about writing and the ways youngsters learn to write. Encourage publication of good student writing in school newspapers, literary journals, local newspapers, and magazines. See that the high school's best writers are entered into the NCTE Achievement Awards in Writing Program, the Scholastic Writing Awards, or other writing contests. Let everyone know that writing matters to you. By becoming an active participant in your child's education as a writer, you will serve not only your child but other children and youth as well. You have an important role to play, and we encourage your involvement.